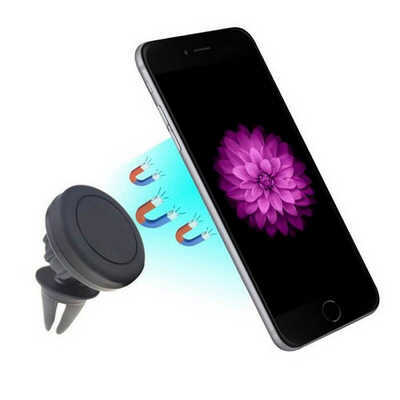 Plastic Car Air Vent Mobile Phone Holder. 1. High quality PC+ABS material, rubber cover, magnetic suction. 2. adjustable arm fits for all your mobile devices. 3. Easy to install, no tools required. Package contents: instruction sheet x 1. metal sheet x 2. Item Size: 45 mm x 45 mm x 60 mm. Package: white paper box. Colour Range: black. Decoration Area: 27 mm D. Decoration Methods: Pad Printing. Price includes : 7 days 1c/1p printed. Setup is not included, please ask for a final price from your sales representative.